This blog entry was written by Daniel Nordmann, GIZ trainee seconded to the Water Integrity Network in September and October 2012. 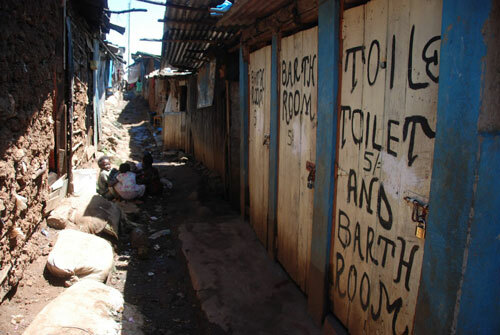 The daily reality of most of the Kenyans living in the Mathare slum, on the outskirts of Nairobi, is one of informal water supply, where prices, quality and reliability of the water are not ensured. The lack of sanitation facilities forces people to resort to “flying toilets”, plastic bags used for defecation which are thrown into ditches, or to use an open field as a “public toilet”. This is not only the daily life of the residents of Mathare, but it is also the reality for many of the one billion slum dwellers around the globe. To tackle this problem, the United Nations General Assembly has declared access to Water and Sanitation a Human Right in 2010. This news item was written by Paschal B. Bagonza, Mary Mwendwa and Gasirigwa Sengiyumva in combination with their participation in the training on water integrity for journalists in East Africa that took place in July 2012 in Kenya. For numerous families in rural Kenya without piped water, buying water from private vendors can cost a huge proportion of their meager household income, causing families to resort to untreated water from wells, rivers, and streams. However, the situation is different in Kanyone – one of the rural villages in northern Kenya. Residents of Kanyoni village have a reason to smile because for them, access to clean and affordable water is not a problem. This news item was written by Sarah Tumwebaze and Joseph Ngome in combination with their participation in the training on water integrity for journalists in East Africa that took place in July 2012 in Kenya. Unlike other cities and towns in Kenya that experience acute water shortage daily, Nanyuki town residents are a happier lot. They have smiling faces because their water supply is running every day and they receive adequate and clean water for their domestic use and other industrial purposes. Almost every household has running water in Nanyuki. Jacob Baraza is a coordinator at Transparency International Kenya (TI Kenya) where he has worked, among other things, with the Transparency and Integrity in Service Delivery in Africa (TISDA) with a focus on water services. The training of trainers (ToT), part of the Regional Water Integrity Capacity Building programme in sub-Saharan Africa by the UNDP Water Governance Facility (WGF) at the Stockholm International Water Institute (SIWI), the Water Integrity Network (WIN) and Cap-Net, was held in Nairobi Kenya between 18th and 22nd of June, 2012. This training was a result of the need to develop capacities on water integrity and to create a pool of trainers able to continue this capacity building. This need has also been highlighted in the Global Corruption Report 2008 on the water sector, and expressed in the 2009 Water Integrity Network (WIN) surveys. What can journalists do to fight corruption in the water sector? Written by Alexandra Malmqvist, Communications Coordinator at WIN. This post was also featured as a news item on the Transparency International website. Corruption in the water sector can mean that money intended to improve water infrastructure and increase people’s access to clean water is misused. When money gets diverted people have to continue to rely on insecure and polluted water sources for hygiene, drinking and food preparation purposes. Corruption and lack of accountability can also mean that the powerful farmers and businesses divert the much needed water from small scale farmers who especially in dry season rely on irrigation from the rivers to grow the crops and make a living. Shortly before the end of 2011, I travelled to Kenya with the intention to put the ‘Annotated Water Integrity Scan (AWIS)’ to use together with some of our partners. We frequently talk about AWIS, a tool developed by WIN, as a diagnostic tool that helps to explore the status of integrity as well as to determine corruption risks but it is also can serve other purposes. 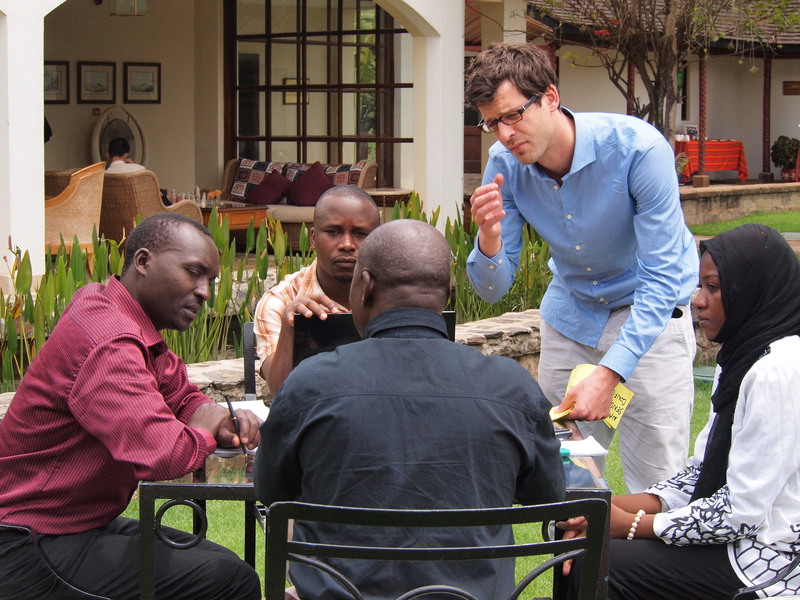 In Nairobi, we organised a training of facilitators as well as an AWIS on urban water supply together with TI-Kenya. Particularly during the scan on urban water supply it became apparent that AWIS can generate a detailed snapshot of the mechanisms that are in place in the water sector. What also became apparent is that the AWIS approach helped to set a constructive atmosphere for dialogue about sensitive issues. The tool has specifically defined indicators for different water sector specific risk areas allowing for structured dialogue among experts. In the workshop itself participants are put into a situation in which they jointly have to think of arguments others may have to evaluate these indicators more positive or negative than they themselves. In this way AWIS helps to structure information that is already available. At the same time, it creates acceptance for the results and allows the participants to develop anunderstanding of the perspectives of others. This is in line with the perception of the participants of the AWIS that took place some days later in Mombasa, who felt that “the [water] sector needs to benefit from this tool”. Participants concluded that AWIS can contribute to overcoming a lot of the constraints the Kenyan water sector is facing, of which many are linked to governance. In a next step we seek to verify the results of the first AWIS and share them with a wider group of stakeholders. This should lead into the development of specific activities to improve transparency, accountability and participation in urban water supply. In parallel we are finalising different materials (e.g. a video and a facilitator’s guide) as a basis to enable Kenyan actors and others to use AWIS.